Make the chicken master stock by following the recipe here. Preheat oven to 220°C (425°F). Remove the cooked chicken from the broth and carefully remove the skin. Place the skin on a lightly greased baking tray and cook for 8–10 minutes or until golden and crisp. Place on a wire rack to cool. Shred the chicken meat, discarding the bones. 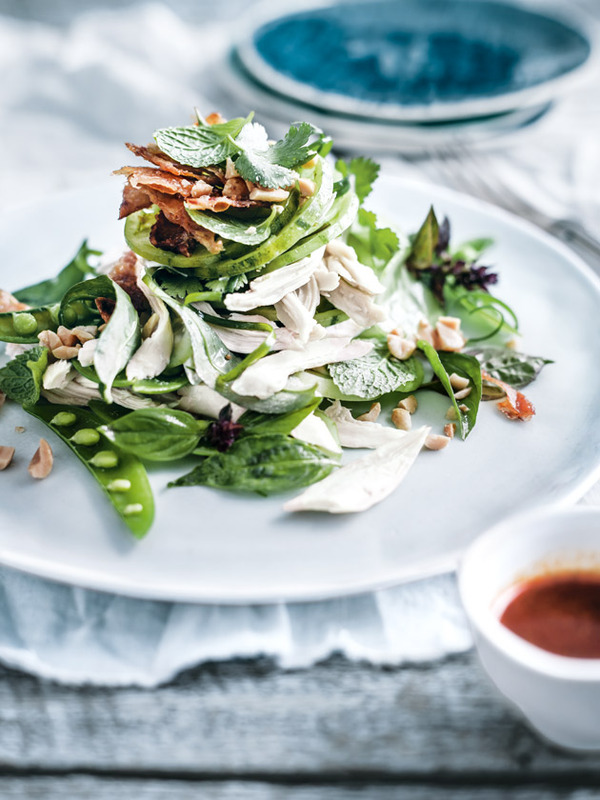 Place the shredded chicken, mint, Vietnamese mint, coriander, Thai basil, cucumber, tomato and sugar snap peas in a bowl. Place the chilli jam and vinegar in a separate bowl and whisk until well combined. Top with the peanuts and the crispy chicken skin. Serves 4–6.